TRUJILLO, Honduras—An opening ceremony marking the start of operations for Continuing Promise 2017’s (CP-17) second mission stop took place Feb. 21 in Trujillo, Honduras. Continuing Promise 17 is a U.S. Southern Command-sponsored and U.S. Naval Forces Southern/U.S. 4th Fleet-conducted deployment to conduct civil-military operations including humanitarian assistance, training engagements and medical, dental, and veterinary support in an effort to show U.S. support and commitment to Central and South America. The event was attended by local government officials; U.S. and Honduran military personnel; and the Honorable James Nealon, U.S. Ambassador to Honduras, who highlighted how the two nations’ partnership will make the 10-day mission stop successful. “I’m glad for the opportunity to be able to participate in the opening ceremony here today. The medical, dental, and veterinary services being provided to citizens all require an enormous amount of coordination with many people working together, and I am very thankful for the personnel here supporting Continuing Promise,” said Nealon. Following the festivities, Mission Commander Capt. Errin Armstrong shared that the team was eager to work with their Honduran counterparts to provide services to local residents. “I know that our team is ready to get out into the local community and assist as many people as we can. This visit is a great chance for the team to work alongside host nation providers, learn from each other and build partnerships that will continue to benefit the people of Honduras in the future,” said Armstrong. 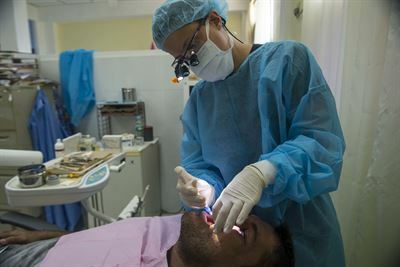 During the visit, host nation and mission personnel will provide a variety of medical and dental services at a local elementary school in Trujillo and participate in several knowledge exchange and training (KET) events at Hospital Salvador Peredes. Also, CP-17 team members will collaborate with the ministry of public health for family planning, nutrition and infection control training at KET sites throughout Trujillo. Members of the veterinarian team will provide animal sterilizations and vaccinations services for residents and local dairy farmers in conjunction with the Trujillo Pet Project. The U.S. Fleet Forces Band will perform for students at the Centro de Educacion Basica in Puerto Castilla and the Plaza Trujillo Parque Central while in Honduras, and the preventative medicine team will conduct training with local public health officials on insect control, waste management and water quality testing. The next scheduled stop for CP-17 is in Colombia before the mission concludes in April.